Greater Noida is shaping up as India's smartest city, the National Capital Region's most modern urban development centre. And the fastest-developing center of attraction for people from Delhi, Noida, Ghaziabad, Gurgaon and Faridabad. 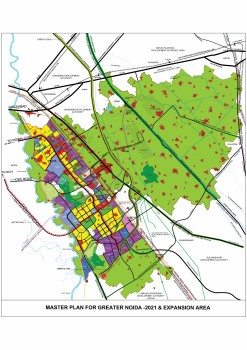 Greater Noida has emerged as a modern model of far-sighted town planning. 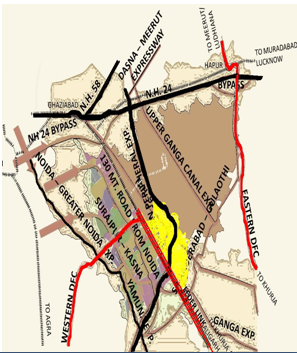 Greater Noida city is located at the intersection of the Western and Eastern Dedicated Freight Corridors. 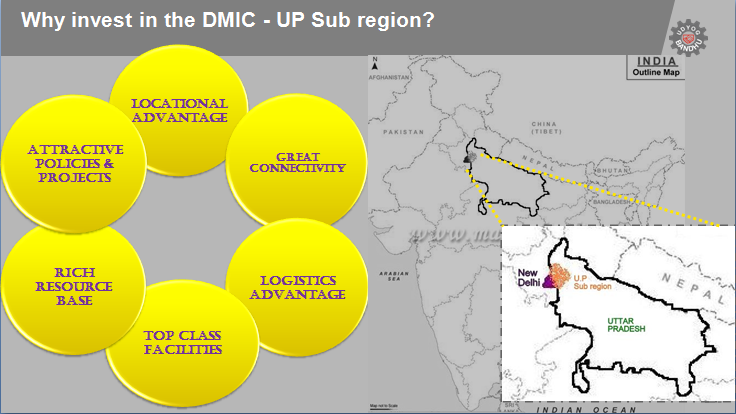 It is also the gateway to the Delhi-Mumbai Industrial Corridor (DMIC). * Important expressways originate from this city, namely the Yamuna Expressway from Greater Noida to Agra. * An eight-lane, 25 km-long expressway connects Greater Noida directly to Delhi. * Greater Noida is the only city in North India with privatized power distribution, which ensures efficient power supply. * Eastern Peripheral Expressway, under development, will take off at Kundli and will join NH2 at Faridabad via Ghaziabad and Greater Noida. 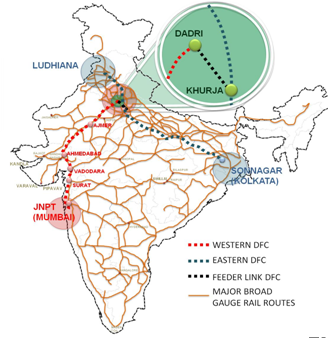 The Howrah-Delhi main railway line passes through the area. * The state-of-the-art Boraki railway station is to serve the Noida-Greater Noida-Sikandrabad-Bulandshahar hinterland at a projected cost of INR 132.49 Crore. * A Medical University is proposed to be developed with state-of-the-art facilities near Gautam Budh University in a total area of 56 acres at an estimated cost of construction of this multi-speciality hospital at INR 939 Crore. The Medical University will offer facilities for courses in MBBS, BDS, MD and MDS. * A Convention center is proposed in an area of 31.25 acres with facilities including Iconic Tower, Exhibition space, Auditorium, Hotel & Fitness Center, Restaurants, Shopping area etc. attracting investments worth INR 1500 Crore. * With a large number of automobile and automobile component manufacturers located here, Greater Noida is increasingly being referred to as “the Detroit of North India”. Industrial majors such as Asian Paints, Bharat Petroleum, Delphi Automotive Systems, Yamaha Motors, Honda Siel, LG Electronics, New Holland Tractors, Pepsi, Hindustan Times and Moser Baer India have all chosen Greater Noida as their preferred industrial and operational base. * A Night Safari covering an area of about 136.68 hectare, Greater Noida's proposed Night Safari is the fourth such project of its kind in the world, after Thailand, China and Singapore. The proposed investment is of INR 500 Cr with anticipated attendance 750000– 825000 per year, guests carrying capacity: 7,000 per night and a total Tram carrying capacity for Shikar Night ride of 9,600 seats. * Metro Rail Link from Noida to Greater Noida with a total Length of 29.707 km is proposed at a total estimated cost of the Project of INR 5064 Crore including land acquisition in the area. Moreover, the key features of the area are the inter-flowing green spaces, a grid iron pattern of wide roads for an efficient transport system and a unique integration of industrial, commercial, institutional and residential zones. There are plenty of social and recreational facilities, including the 18-hole, 236-acre PGA-standard golf course designed by renowned-golfer Greg Norman. And an endless supply of unpolluted, fresh air! * A Multi Modal Transport Hub is being planned to be located at Boraki and a Multi Modal Logistics Hub is being planned at Dadri. * A comprehensive built environment to enable the setting up of Electronics, Automobile, Food Processing, Bio-tech, IT/ITeS and R&D businesses. * State-of-the-art residential, commercial, institutional and recreational amenities. * Transportation facilities within the DNGIR and to outside. * 3500 MW Power Plant at Dadri to ensure uninterrupted power supply. * Excellent potable water through linkage with the Upper Ganga Canal Project. * Energy efficient design and Waste treatment to ensure Environmental standards. * Proximity to the National Capital Region of Delhi (just about 60 km away). * Noida, the vibrant satellite town of Delhi with IT/ITES and electronics industries is adjacent. * Ghaziabad, the hub of light engineering and electronics industries is nearby. * Strategically located with two National Highways, NH-24 (Delhi-Lucknow), NH-58 (Delhi-Haridwar-Mana Pass). * Would be served by proposed Eastern Peripheral Expressway (Ghaziabad-Noida-Palwal & Kundli-Ghaziabad) of NCR. * Close to Dadri Railway Junction where Eastern and Western Freight Corridors meet. * Air connectivity – through Highspeed Metro Rail from Greater Noida to Int’l Airport at New Delhi.